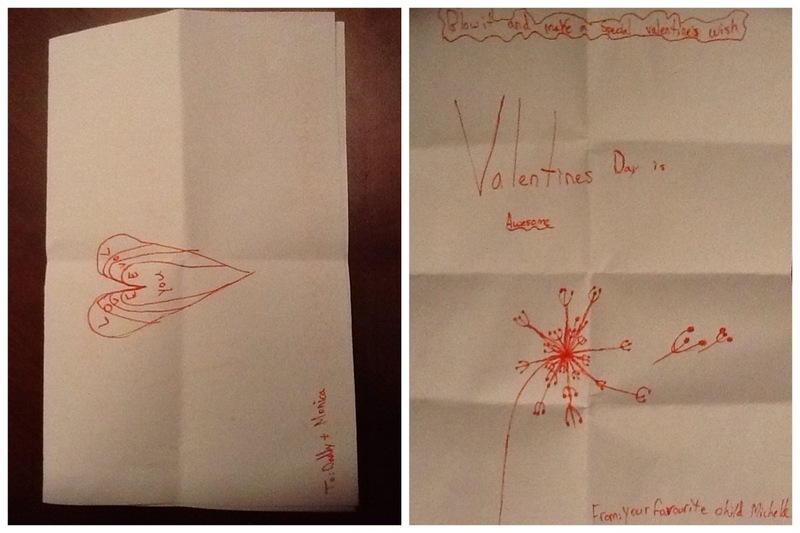 This is my first Valentine’s Day as a stepmother and I received a very thoughtful gift from my “favourite child” :) It was a simple, handcrafted card from my stepdaughter but it was really touching. It gave me warm fuzziness. Appointments are now every two weeks (starting at 30 weeks but I missed posting my last update). News from last week: no weight gain since week 28 and baby’s size is back on the “average” track. Physically, I’m still feeling pretty good overall but I’m starting to feel like a big lump getting up from the couch or shifting sides in bed. Putting on socks is also getting to be a challenge. It’s a fun challenge though, as each morning I’ve been trying some creative ways to get those socks on. With regards to sleep, it hasn’t been so great. Once again (like my first trimester), I’m up 2-3 times a night to empty that bladder! This must be mother nature’s way of getting me used to the little sleep I’ll get with the newborn. When it comes to clothes, I’ve noticed my belly’s significant growth. 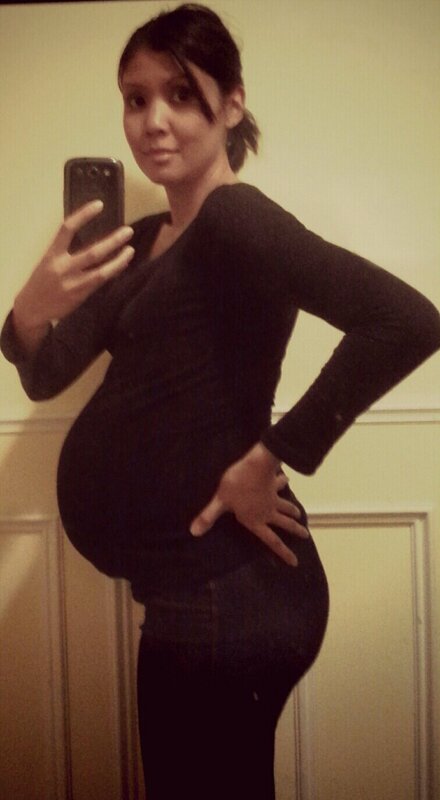 I’ve made it this far without purchasing very many maternity clothes: 3 pairs of pants and 1 dress. I made 2 skirts and 1 top. However, I now have very little pre-pregnancy tops that will fit. I may need to make just a few more purchases to get through the last couple of months. I have a ski jacket that fits my belly perfectly right now, but that won’t be true much longer, so I decided to transform my other winter coat with a removable panel. 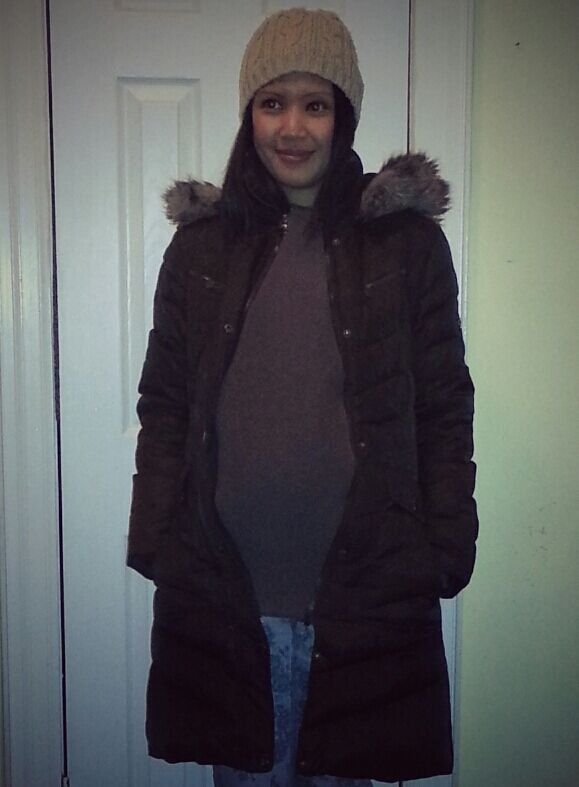 I thought it would be a waste to buy a maternity coat given I only have 2 months to go. The only problem I had was finding a zipper that was compatible with the coat’s current zipper. Apparently, US-made clothing use left-handed zippers (the slider on the left). However, in Canada, we only have the right-handed zippers in stores. 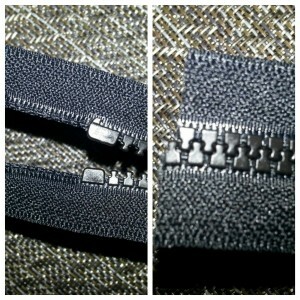 Luckily the brand of zipper I bought (YYZ Vislon) can be adjusted since the teeth are the same on both sides. Slip the slider back on the zipper facing backwards. And there you have it. The slider is now on the left-side, making it a left-handed zipper. 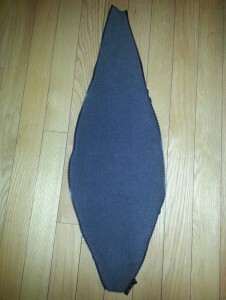 Here’s the panel made of micro-fleece and lined with a wind-resistant fabric.